Middle Eastern oil production is expected to grow by 2.7 million bpd by 2025, according to latest Rystad Energy analysis. 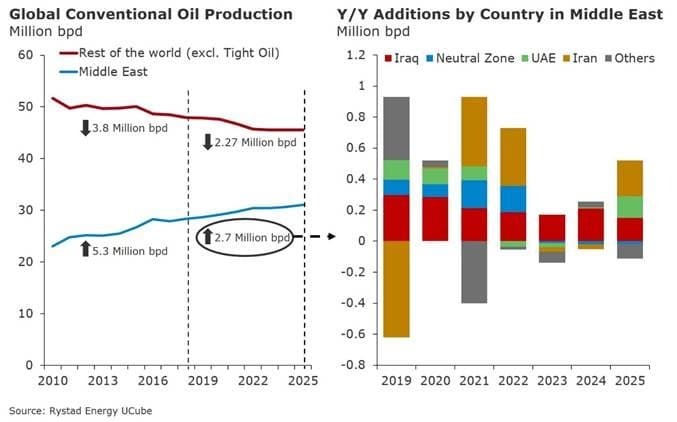 The boost in conventional oil output from the Middle East is primarily driven by supply additions from Iraq with 1.5 million bpd growth, and an additional 1.2 million bpd mainly coming from the Neutral Zone, the UAE and Iran in the medium term. 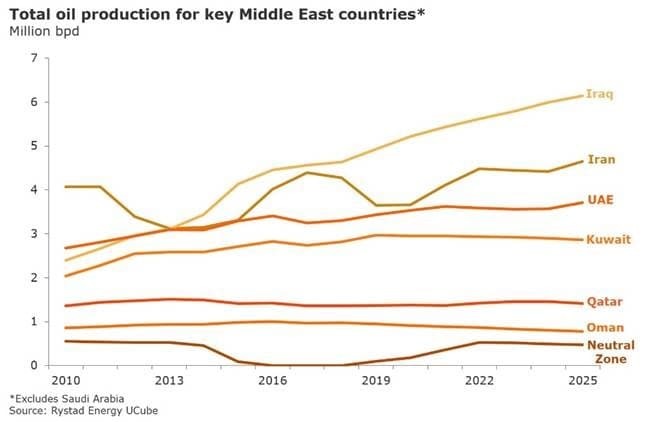 Output from conventional fields outside the Middle East peaked in 2010 and is expected to continue falling with current estimates putting 2025 output at 45.6, a 2.3 million barrel decline from current levels. 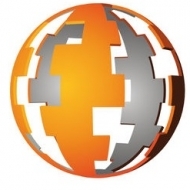 Rystad Energy forecasts the country’s oil production could grow to 6.15 million bpd in 2025. The current ramp up from producing assets is expected to add about 625,000 bpd on the country’s output of about 4.65 million bpd. The growth will primarily be driven by the giant southern fields, Rumaila, West Qurna-1 and West Qurna-2. Over the past 18 months, the country has seen the sanctioning of expansion projects at Majnoon, the third phase of Halfaya development and the second phase of Garraf. These fields could add another 550,000 bpd over the next seven years. An additional 325,000 bpd could be added through near-term project approvals. These developments could include full field development at Faihaa, and further expansion of Nasiriyah and Shaikan. With the official re-imposition of financial sanctions by the United States, Rystad Energy expects annual average Iranian oil output to dip y/y by 700,000 bpd in a conservative case (accounting for waivers granted for Europe, India, Japan and South Korea for 180 days). Should sanctions be adhered to and then lifted in 2021, underinvestment in the interim would slow the eventual ramp up in production. In which case, the producing fields would be able to restart at 90% of the pre-sanction levels and ongoing developments – primarily at South Pars (13, 14 and 22-24) – would add about 50,000 bpd by 2025. Furthermore, the development projects with FIDs delayed due to the sanctions, once restarted, have combined potential to add over 325,000 bpd. The country has already sanctioned expansion projects developing almost a billion barrels of oil resources in 2017-18 which have the potential to add about 350,000-400,000 bpd production in the medium term. The notable development projects sanctioned over the past 18 months include the expansion at Bab (Thamama A/B/H), the second phase of Qusahwira and Haliba fields. In addition to these projects, ADNOC could potentially sanction and bring online further expansion of the Bu Hasa and Umm Shaif fields, sustainable facilities project at Bab, and the Upper Zakum expansion where the production is expected to increase by 250,000 bpd (reaching 1 million bpd). These developments could further boost the output by 750,000-800,000 bpd by 2025. The oil production from the Neutral Zone shared between Saudi Arabia and Kuwait, has been shut since 2015. Earlier this year, the two sides began negotiations concerning the restart of the fields. Rystad Energy’s base case incorporates a restart and gradual ramp up of fields in the Neutral zone to about 500,000 bpd in the medium term. I think it's kind of sobering to see how much economic world-oil resource has declined. Remaining bright spots in production are not so bright when you consider the the why of production ups and downs. By and large, ups and downs are due to military conflicts or economic sanctions. Production goes up and down as the result of the onset and relief of these age-old power plays. Unfortunately, this has been the history of oil. Conflict and resource grabs. I ask, would the world fare better if countries produce and consume their own clean energy?